We are a Brisbane City church on the fringe of the CBD in a neighbourhood of multi residential buildings and small businesses. Access to the church and to the hall is by a few steps with handrails at the front of each building. A portable ramp can be made available at the back door of the church for wheelchair access. Street parking near the church is metered during the working week but free on weekends (with a 2 hour time limit on Saturday mornings in some streets). St Paul’s Terrace is a clearway from 7-9 am and 4-7 pm week days. Parking in the church grounds is very limited and we ask that it be used only for those with walking difficulties. Brisbane City Council buses stop right outside the church on St Pauls Terrace. For people of moderate fitness, St Paul’s can be reached on foot from Central Railway Station with about a 10-15 minute to walk uphill part of the way. Alternatively, commuters can alight at Brunswick Street Station and catch a bus to St Pauls Terrace. The hearing aid loop will assist people who have a T switch on their device. Our modern sound system provides uniform volume throughout the church. It also has the capability to record services. A number of large print Bibles are available. The toilet block is behind the church hall and is accessed via a pathway between the church and hall. A babies’ change table is provided in the ladies’ toilet. Activity bags for children of varying ages can be borrowed from the church porch for use in worship if restlessness becomes an issue. A complete guide to the buildings can be found here. 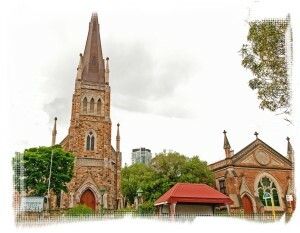 The church building is a gothic-styled, heritage-listed church with a bell tower and tall spire. It is a beautiful worship space, a calming sanctuary away from the hustle and bustle of every day life – a space of tranquility in which to spend time with God. The pulpit is central and elevated. The raised sanctuary area accommodates the communion table and baptismal font. Choir stalls at the side of the church provide a dedicated area for choristers adjacent to the pipe organ. The long central aisle is a feature that attracts many brides to St Paul’s. 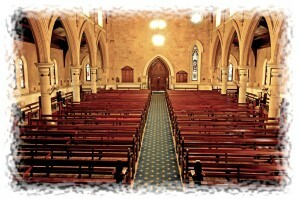 The pews in the body of the church provide seating for at least 300 people. The church hall, slightly older than the church by just a few years, is also heritage-listed. 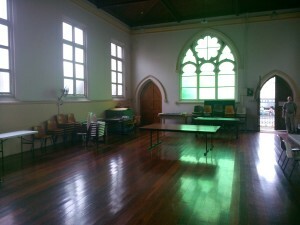 It is our venue for morning tea each Sunday and is the meeting space for the Sunday School. 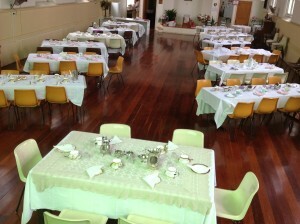 The hall is equipped with kitchen facilities and catering requirements for functions. For enquiries about the hall, call Geoff on 0428 71 2 756. To find St Paul’s on a map, go to Contact page.